This is a guest post by Mary Karalis. Mary is a busy, expectant mama, who also happens to be a TV producer for a morning lifestyle show. Follow Mary on Instagram and Twitter to see what she is up to! The baby gear world is a multi-billion dollar industry. After going through the registry process as a first-time mom, it’s easy to see why. There are a seemingly endless amount of supplies for expectant parents. Now, as a seasoned mom of one spirited little toddler, I feel like I have some more knowledge and grasp on items that are necessary – and unnecessary – to help care for baby. Here’s a list of some items I loved the first time around – as well as new items I’m excited to try. The Boppy is a beloved new-mom staple for a reason. This wrap-around-body pillow hugs mama and gives plenty of support for both the sleepy breast feeder and baby. This item – to me – is an absolute must-have for the first few months of breastfeeding. I will certainly be using this for baby number 2! I am a big believer in baby wearing. My daughter always loved to be snuggled up close to mama in the Boba Wrap. It was especially nice to keep her snug inside the wrap during holidays, when she would otherwise be passed around the family like a football. Sorry, aunties and nana – sometimes baby just wants to be close to mommy! This time around, with a summer baby on the way, I plan to utilize my Lillebaby Ring Sling with my newborn. I expect this to be particularly helpful with a toddler to chase! Earth Mama Angel Baby is one of my favorite personal hygiene brands. Specifically formulated for sensitive skin, the baby body wash and shampoo is a staple in my house. I like that it’s non-toxic and made with castile soap and essential oils. We still use this on my 2-year-old, so I’ll definitely be ordering more for my many years of baby bath time. This little hammock looks super cool! Made to clip into most shopping carts, this baby hangs elevated to leave room for groceries! It also rolls up to fit into my diaper bag when I’m finished shopping. I remember keeping my daughter in her car seat while I shopped – and the thing took up way too much cart real estate! It also slid all over the place. This hammock is meant to lock in securely, keeping a snoozing baby safe and comfy. Having my toddler in the front of the cart should make shopping a breeze and I can’t wait to use it! I’m a big believer in bed-sharing. Shocking, I know. The baby wearing, non-toxic soap-loving mom loves to bed share. But I am a big believer in safe bed-sharing and co-sleeping. The Snuggle Me is said to recreate the feeling of the womb, hugging and soothing baby during sleep. And unlike some other baby pillows, the Snuggle Me is not inflated. It has an unpadded center to take on the firmness of the surface it’s on (such as a bed). The Snuggle Me is certified from the Consumer Product Safety Commissioner, making me believe it a safe choice for my bed-sharing ways. Ju-Ju-Be is a diaper bag with a mom cult following, and the accessories are just the whipped cream topping. I recently purchased my first Ju-Ju-Be backpack, and I must admit – I’m hooked. So to help with organization in my new bag, I would love to try the set of accessory bags called “Be Set.” They look like mini-purses, designed for the mom-on-the-go. I also love that all of Ju-Ju-Be’s products are machine washable. Super helpful for the messy world that is parenting! So, there you have it. 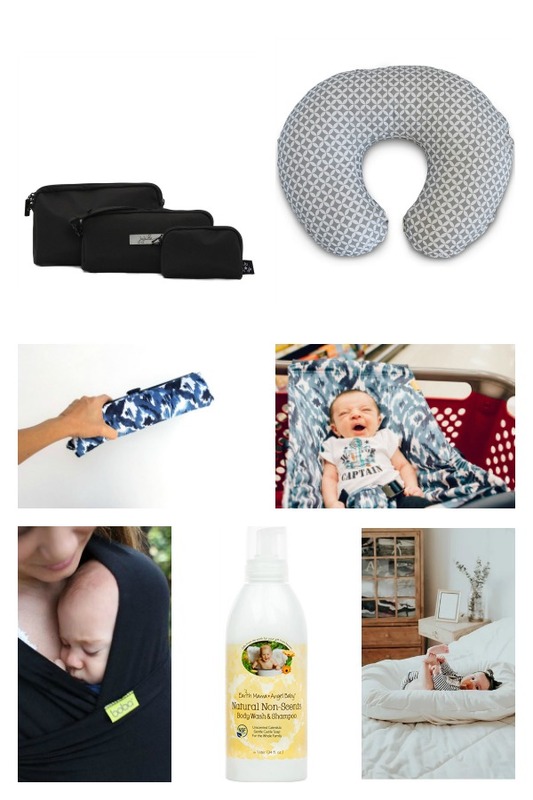 My list of baby items I know I love and new items I’m excited to try! What baby products do you absolutely love? List them below in the comment section to keep the conversation going!